Discover the rustic charm of this plein air picture frame with a bold farmhouse style. A dark and light grey finish combined with a wide and chunky profile is delightfully rough-to-the-touch made with real wood sourced from sustainably managed forests. Its knotholes and grooved distressing adds earthy warmth to landscape paintings, nature photography and family photos. 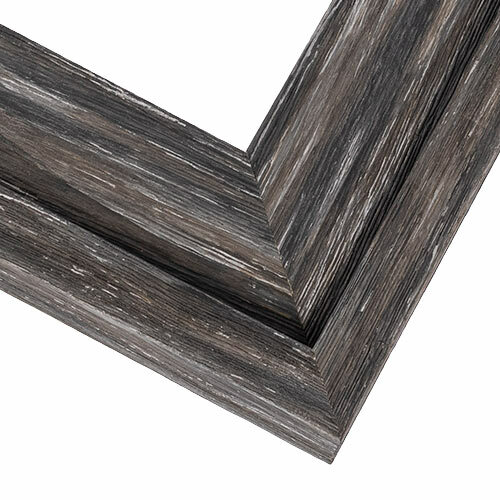 Can this frame accommodate a linen liner? What would the cost be? BEST ANSWER: This frame can accommodate a linen liner. We would be happy to price that for you if you call us with your size and selection. We are in the process of updating the website to enable this feature. Thank you for bringing it up!